David De Gea's possible move from Manchester United to Real Madrid is a deal rooted entirely in logic. It's a pretty simple equation: Real need a new goalkeeper, De Gea is one of the best available, he is from Madrid, his girlfriend and family live in the city, and he is well regarded in Spain. Most importantly, the 24-year-old, who has one more season left on his United contract, wants to join the club. Add into the mix the fact United have a ready-made replacement in Victor Valdes, as well as the clamour among Real fans for a new man between the sticks, and it's easy to see why this particular nugget of transfer speculation is big news in Spain and England. Certainly the influential Spanish newspaper Marca is expecting De Gea to arrive in the capital over the summer after devoting its front page to the story on Saturday under the headline 'Done Deal'. 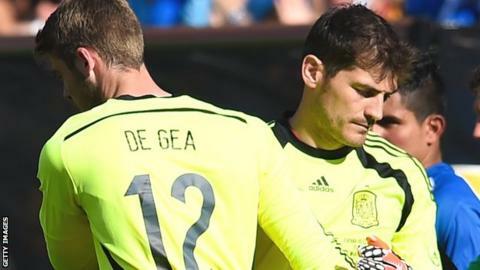 De Gea, who came through the ranks at Atletico Madrid, will have huge gloves to fill if and when he moves to Real, with Iker Casillas - a legend for club and country - the man poised to make way. 'Saint Iker', as he is known, is regarded as one of Real's greats. He joined the club as a child in 1990 before rising through the ranks and making his first-team debut, aged just 18, in 1999. He has since won 18 major honours en route to 724 appearances for the club, second only to Raul in the all-time list. Despite his stellar record and his relatively tender years in goalkeeping terms - he is still just 33 - Casillas's star has been on the wane for some time, and a recent poll of fans by Marca showed that 59% of participants do not want him in goal next season. His place in the Real team first came under threat as long ago as December 2012, when he was controversially dropped by previous boss Jose Mourinho. At first, Casillas's exclusion appeared to be little more than a personal vendetta borne from clashing personalities. But when Mourinho left the club, Casillas failed to win back his league place under Carlo Ancelotti, instead finding himself restricted to cup games only. However, that did mean that Casillas was between the posts for his team's Copa del Rey and Champions League title triumphs last season. "It would be a big blow if United lose David De Gea. First of all, he is more than an average goalkeeper. If you are playing at the top, you are looking for special things. He is the kind of goalkeeper who is special. It is not easy to find someone who has the same quality as he has. "De Gea is only 24. He is not even at the top. In the end it will be more his personal life. What does he want? What does his girlfriend want? He is Spanish. It will be a tough decision for him to make. I think he likes it in England but of course it is a challenge to play for Real Madrid." Yet questions were raised again when he endured a torrid World Cup, delivering a horrendous performance in Spain's shocking 5-1 defeat against the Netherlands. Real subsequently signed Costa Rica international Keylor Navas from Levante, leaving Casillas looking vulnerable, only for Ancelotti to raise eyebrows by reinstating Casillas as his first choice. That bold move was not well received by the Real faithful. The veteran has since been whistled by a significant number of supporters during home games this season and more recently was heckled during a 2-2 draw with Valencia that effectively ended their La Liga title hopes. Significantly, Casillas was captured by TV cameras during that match muttering towards the home fans, angrily telling them what they could do with their complaints. Yet for all of that, Casillas does not want to leave and has regularly stated that he will fight for his place and that he wants to retire with Real. But not many people in Spain share his optimism. And let's not forget that Ancelotti's faith in him is, to be frank, irrelevant - the Italian will in all probability leave the club at the end of the season. At a club where it is the president and not the coach who makes the signings, there is no danger of Real deviating from the pursuit of De Gea, a man with a high profile in his homeland. Crucially, English football is followed closely in Spain, so there is a strong awareness among the population that De Gea has been playing superbly for Manchester United. Newspaper AS devoted its front page to the story on Tuesday, with the headline 'De Gea will come whether Casillas stays or not'. It is also no secret that Spain coach Vicente Del Bosque has earmarked him as Casillas's long-term replacement. Few would bet against De Gea undertaking exactly that role at the Bernabeu too come the start of next season.